Nuclear Weapons Accidents- The Broken Arrow Blog. The B-52G accident on 24 January 1961 near Goldsboro, North Carolina is another example of unfounded hysteria over a nuclear weapons accident. For decades, claims abounded that one bomb, a Mark 39 Mod 2, "went through five of it's six interlocking safety devices" and was only "one step" away from a nuclear detonation. This is not true. The following material has been declassified from various documents obtained from DOE and NNSA. First and foremost, B-52G aircraft power must be applied to the weapon via two crew members using the Aircraft Monitoring and Control System and a specific voltage and amperage (and for a specific amount of time) before the Ready/Safe Switch could be rotated to the "Arm" position. The pilot of the bomber aircraft controlled power via his T-380 Readiness Switch, which was safety wired and sealed near his seat in the aircraft. The Radar Navigator could monitor the bomb's circuits via the DCU-9, but he could not arm it without electrical input via AMAC nor consent from the pilot. The aircrew, in two physically separate positions in the aircraft, had to perform at least 19 steps from their checklist before nuclear weapons could be pre-armed and dropped. Bomb 2, the object of the Goldsboro controversy, was not "one step" away from detonation (nor was Bomb 1). The Mark 39 Mod 2 had two additional safety switches, the Trajectory Arm Switch and Rotary Safing Switch. It should be noted that aircraft power to monitor and pre-arm the bomb is separate from power supplied by the bomb's short life thermal batteries. In Bomb 2, the High Voltage Thermal Battery was not activated, so no electrical power could reach any components necessary to fire the weapon and produce a nuclear explosion. In any regard, the R/S Switch, Trajectory Arm, and Rotary Safing Switch prevented any current from reaching the X-Unit. While the Ready/Safe Switch in Bomb 2 showed "armed" after recovery, it was actually safe, and post mortem examination by the AEC proved it to be electronically open (the housing having been destroyed during impact). Most importantly, the high voltage necessary to fire bomb components was not present for bomb 2. In Bomb 1, the HVTB did activate, however the three safety switches, the MC-772 Ready/Safe Switch, the MC-732 Trajectory Arm, and the MC-788 Rotary Safing Switch prevented any voltage to reach components necessary to arm and fire the bomb. The arming and firing sequence is quite complex, and much more was required to produce a nuclear explosion. It should be noted that in several other accidents, thermal batteries were activated due to severe ground impacts. In all cases, from lightning strikes to accidental jettisonings to crashes, the safety features, although not as advanced as today's nuclear safety concepts, were well designed, tested, and robust. 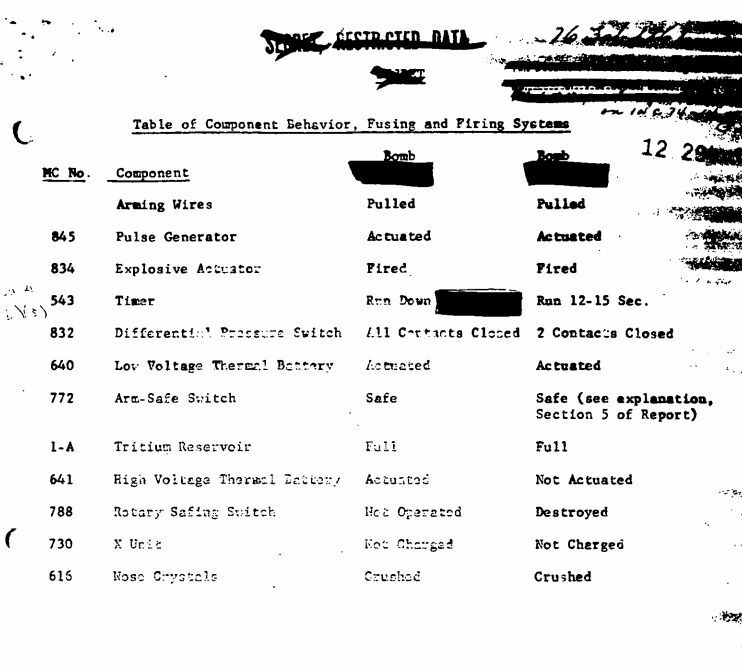 Documentaton obtained through the Freedom of Information Act, including copies of the original AEC and EOD reports, are available in "Broken Arrow, The Declassified History of Nuclear Weapons Accidents" by Michael H. Maggelet and James C. Oskins. It should also be noted that Bomb 2's secondary, containing uranium and lithium, was not recovered and poses no detonation hazard. How close was the Goldsboro bomb to producing a nuclear explosion? Not at all. An excellent, authoritative article. Clearly written with the benefit of great technical expertise and contemporary, hands-on experience of precisely the sort of weapons and systems under discussion. I wonder why it is that Eric Schlosser doesn't appear to have a blog of his own on the subject and we must instead rely on lib/left shills such as The Guardian, the BBC and other commercial media who seem only too happy to reproduce the Goldsboro Myth pretty much verbatim and without comment. Of course, the story as it is reproduced plays into the mentality of the Fischer Price School of Smug Bedwetters as it makes the US seem like irresponsible buffoons just like that 1960s documentary "Dr. Strangelove." Well done Mssrs. Oskins & Maggalet. That's one in the eye for the clueless old hippies of this World. Here's a thought: why is it that when such clear evidence is available that neither Mk 39 bomb was in any danger of exploding, has the hysterical article of doom gone global, seemingly without being challenged? 64 AF ATOMIC ENERGY PROGRAM, Vol. IV, p. 89. 65 Rosengren, RDA-TR-122100-001-Rev. 1, p. 102. Again, Mssrs. O&M are in lock-step with Sandia and Mr. Hansen on this: they indicate quite plainly that the nose crsytals were both present and "crushed." O&M: bang on as usual with impeccable facts. So, if all the other fuzes failed and the bomb still didn't go bang (conventionally or otherwise) the bomb obviously was neither armed as a viable nuclear weapon, nor had it run through all the other fuzing processes. As O&M state: How close was the Goldsboro bomb to producing a nuclear explosion? Not at all. Additionally, the Mk 39 bomb's thermal batteries could not be used to rotate the MC-772 Ready/Safe Switch.The X-unit was isolated and housed in the cartridge assembly, which is shielded to prevent any stray voltage from activating components. An inadvertently armed weapon can be safed using the AMAC equipment, or by manually rotating the switch to "safe"- it could not be manually armed. As for the MC-772 being a "cheap" switch, Sandia Corporation designed, tested, and oversaw the production (usually through contactors) for the fuzing and firing components of the weapons. Current from the high voltage thermal battery could not charge the X-unit due to the MC-772 and MC-788 safety switches. Additionally, they blocked current from the low voltage nose impact switches (piezoelectric crystals) which could not detonate the weapon (since the X-unit was not charged). Many more components in the X-unit would have to be charged in order for a nuclear detonation to take place, and the sequence of operation was blocked by the two safeties (which were electrically operated solenoids). Info declassified from SNL history documents on the Mark 39 and Defense Special Weapons Agency technical safety review. After retiring from the U.S. Air Force in 1995, I became active in historical research and living history. I've published newsletters, created and managed websites, and otherwise spent considerable time researching, and often correcting, disinformation on nuclear weapons and military history in general. My other interests include "experimental archaeology", or re-discovering skills and survival techniques from the prehistoric era to the modern day.